Baidu makes money primarily via online marketing services (advertising). In fact, in 2017 Baidu made about $11.24 in online marketing services and a remaining almost $1.8 billion through other sources. According to Statista, Baidu has an overall search market share of 73.8% of the Chinese market. Other sources of revenues comprise membership services of iQIYI (an innovative market-leading online entertainment service provider in China) and financial services. The tech market in China has grown exponentially in the last decade. In fact, of the 20 world’s largest tech companies China has nine of them. Companies like Alibaba reached hundreds of billion dollars in market capitalization. As Google shut down its search engine back in 2010 due to the Chinese Government censorship that opened up a huge hole that allowed Baidu to build up the most successful search engine in the country. Baidu in a way tried to replicate (with a certain amount of success) Google. Both concerning search and in terms of business model. A few know that Baidu founder was the first one to put together a link based search engine. Google in 2018 is entering the Chinese search market again. Baidu Core business is search. However, it also operates on the broader internet market space. That implies a list of competitors like Tencent, Alibaba, Sohu, Qihoo 360, ByteDance, Xiaomi, and iFly Technology. How does Baidu make money? What are the main challenges for Baidu? What are the Baidu business segments? Who are Baidu key partners? What are Baidu core products? Who are Baidu’s main competitors? In 2010 the shut down of Google allowed Baidu to take over the whole Chinese market. Robin Li, now one of the wealthiest people in China, launched Baidu in 2000 together with Eric Xu. Back in 1996, Robin Li built RankDex was the first search engine that used hyperlinks to measure the quality of websites it was indexing. In 1998 RankDex was acquired by a Dow Jones subsidiary Tradeline.com. Even before Google’s Larry Page had built the algorithm that would make Google the most popular search engine on earth, PageRank. Yet in 2000 after gathering financing from an early stage venture capital firm (Integrity Partners), the company launched in China. Today Baidu has most of China’s search market share. We generate substantially all of our revenues from online marketing services, a substantial majority of which are derived from our pay-for-performance, or P4P, services. Our online marketing customers will not continue to do business with us if their investment does not generate sales leads and ultimately consumers, or if we do not deliver their web pages in an appropriate and effective manner. Our P4P customers may choose to discontinue their business with us, which are not subject to fixed-term contracts. In addition, third parties may develop and use certain technologies to block the display of our customers’ advertisements and other marketing products on our Baidu platform, which may in turn cause us to lose customers and adversely affect our results of operations. Furthermore, as our auction-based P4P services enable our customers to bid for priority placement of their paid sponsored links, we may lose customers if they find the bidding mechanism not cost effective or otherwise not attractive. Additionally, if our users do not increase their search frequencies on our platform, or our content ecosystem fails to offer rich and quality content that meets users’ tastes and preferences, or our users spend more time with or otherwise satisfy their search demands on competing platforms, or we otherwise experience user traffic decline due to any reason, it would be difficult for us to attract new customers or retain existing customers. Failure to retain our existing customers or attract new customers for our online marketing services could seriously harm our business, results of operations and growth prospects. Other revenues increased by 93.6% from RMB6.0 billion in 2016 to RMB11.7 billion (US$1.8 billion) in 2017, which was mainly due to the growth of membership services of iQIYI and financial services. 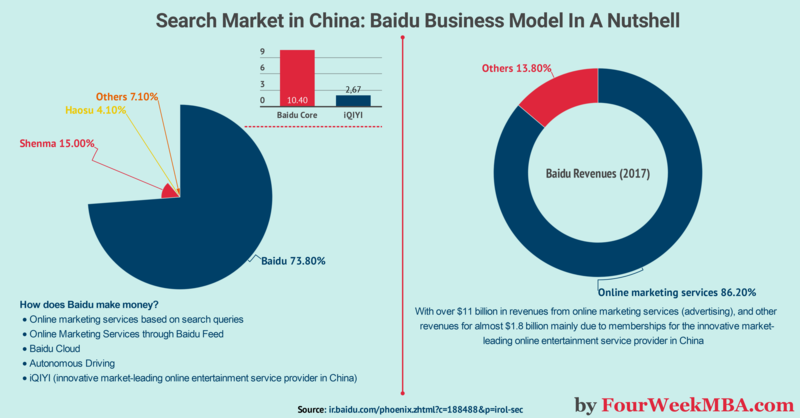 Baidu Core: mainly by providing keyword-based marketing services, which target and are triggered by internet users’ search queries, including primarily P4P services, other online marketing services, and artificial intelligence-enabled new business initiatives. geopolitical events, natural disasters or epidemics. Baidu.com is the largest website in China and the fourth largest website globally, as measured by average daily visitors and page views according to Alexa.com, an internet analytics firm. Also, “Baidu” was ranked as the fifth of the highest ranking brands in China in BrandZ Top 100 Most Valuable Chinese Brands 2017, a study published by Millward Brown Optimor, a brand strategy research company. The operations are primarily in China. Revenues generated from the operations in China accounted for approximately 97.8% in 2017. Users: Baidu enables users to be connected to relevant information online, including web pages, news, images, documents, multimedia files, and services, through links. Baidu claims to use AI to enhance user experience and deepen user engagement. Customers: Baidu delivers online marketing services to a diverse customer base operating in a variety of industries. In 2017, Baidu had approximately 775,000 active online marketing customers. The online marketing customers consist of SMEs, large domestic businesses and multinational companies. Baidu has customers located throughout China. Yet it has a more active and larger customer base in the coastal regions, following the current general economic demographics in China. Customers for iQIYI: they primarily consist of advertisers, who are counted as part of online marketing customers, and membership subscribers of online video contents. Customers are reached via direct sales force as well as a network of third-party distributors across China. Distributors help Baidu identify potential SME customers, collect payments and assist SMEs in setting up accounts about online marketing services. Mobile revenues accounted for 73.1% of total revenues in 2017. Baidu Union Members: Baidu Union consists of a large number of third-party web content, software and mobile app providers. Baidu Union members can display on their properties customers’ promotional links that match the content of such members’ properties. Some Baidu Union members also embed some of the products and services onto their properties. Baidu Mobile Assistant: a mobile app marketplace designed for Android mobile devices. Online marketing services through Baidu Feed can help customers precisely target the right feed users based on user data on the Baidu platform. Online marketing services based on contextual, audience attributes, media, and placement attributes refer to the programmatic marketing service transaction system, which includes supply-side platform (SSP), demand-side platform (DSP), Baidu exchange service platform (BES), and data management platform (DMP). SSP covers media resources of Baidu and third-party Baidu Union members. SSP intelligently manages media advertising space inventory and optimizes marketing spending by analyzing matching content, target audience and characteristics of different media and platforms. DSP is an integrated sales service platform for advertisers and advertising agents, providing programmatic media purchase service. BES is a traffic transaction platform that combines DSP with media resources, by leveraging the traffic advantage and big data capabilities of BES. DMP integrates data from advertisers, Baidu, and third-party data management platforms, which cover searches, offline visits, target audience tags, sequential placements, and crowd portraits, in order to improve the effectiveness and accuracy of DSP. and AI2B (AI as a service) to enterprise customers and developers to build, test and deploy apps Baidu cloud infrastructure. Baidu Cloud is based on the same cloud computing technology that supports Baidu internal functions. Autonomous driving is an important area for future growth for Baidu. iQIYI is an innovative market-leading online entertainment service provider in China. Since 2013 Baidu has been investing in iQIYI. In 2017 Baidu invested 1.5 billion dollars in the company. Baidu search engine is as powerful as Google. I run an experiment to see whether Baidu supported some advanced features (like Google’s featured snippets). In the example above I run the query “what is a Knowledge Graph,” and Baidu gave a direct, relevant answer to my question! That is not surprising, considering Baidu’s founder, Robert Li built RankDex (a link-based search algorithm) even before Larry Page had built PageRank. What’s surprising though is the level of sophistication and advancement Baidu was able to keep up with. Link analysis is a technique that determines the importance of a web page by evaluating the combination of the anchor texts and the number of web pages linked to that web page. The first link analysis system was created by Baidu founder with RankDex, before Larry Page’s PageRank. Baidu compares search queries with the content of web pages to help determine relevance. One example is the proximity of individual search terms to each other on a given web page and prioritizes results where the search terms are near each other. Baidu powerful computer clusters and intelligent scheduling algorithms allow it to crawl web pages efficiently. Based on linguistics knowledge, big data and knowledge graphs, Baidu natural language processing accumulates and integrates linguistics analysis, such as lexical, syntax and semantic analysis, with calculation, learning mechanisms, and other natural language processing technologies. As Google integrated algorithms, such as Hummingbird and its component RankBrain, with the aim of ranking web pages based on meaning, so Baidu uses similar approaches to understand the relevance of web pages. That is a set of open technical standards applying to mobile web pages, which accelerates the loading of mobile web pages. Google has used a similar approach with AMP (accelerated mobile pages). At first sight, Baidu seems the Chinese clone of Google. That is true not only from its search algorithm standpoint (driven by NLP and a similar approach to link analysis) but also in terms of business models. Like Google has been investing in video content with YouTube, s Baidu has been investing since 2013 in iQIYI. Like Google, Baidu believes that one of the most promising future ventures will be about self-driving cars. Also, when we look at revenue sources, 86% of Baidu revenues came from advertising, just like 86% of Google revenues came from advertising in 2017. Baidu also invested in its cloud infrastructure, and it is making money by having members of iQIYI (the Chinese equivalent of YouTube) pay for a subscription fee. When it 2010 Google shut down its China operation that represented a considerable opportunity for Baidu, which has become over the years the most popular site in China and among the most valuable Chinese brands. While it seems the exact copy of Google in China, it is also true that Baidu’s founder created a link-based system before Larry Page. Thus, Baidu might be as an innovative company as Google is worldwide.